The world?s most prestigious wildlife photography competition, Veolia Environnement Wildlife Photographer of the Year, has revealed the commended images from this year?s competition, 2 of which can be seen here. They are among the selection that will join more than 100 other prize-winning photographs, including the overall winning images, when the exhibition debuts at the Natural History Museum, London, on 22 October. It will then tour nationally and internationally after 11 March 2011. More than one million visitors are expected to have seen the exhibition once the tour is complete. Photo captions: (Top right) A carcass-eye view by Juergen Ross (Germany). Category: Behaviour: Mammals -Highly Commended. A feeding lioness is framed by the carcass of a giraffe at South Africa’s Kruger National Park. (Above) Sunset moment by Olivier Puccia (France). Category: Urban Wildlife – Highly Commended. 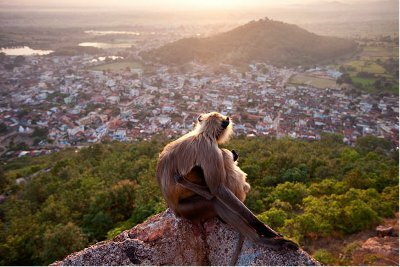 Overlooking Ramtek in Maharashtra, western India, Hanuman langurs find the highest point from which to admire the sunset. Squeezed out of their forest homes by deforestation, Hanuman langurs have become part of urban life in many parts of India. Now in its 46th year, the Wildlife Photographer of the Year competition is an international showcase for the very best nature photography. The competition is owned by two UK institutions that pride themselves on revealing and championing the diversity of life on Earth – the Natural History Museum and BBC Wildlife Magazine. It is an international leader in the artistic representation of the natural world and a competition that photographers worldwide, professional and amateur, aspire to win. Click here for our news story on the exhibition.